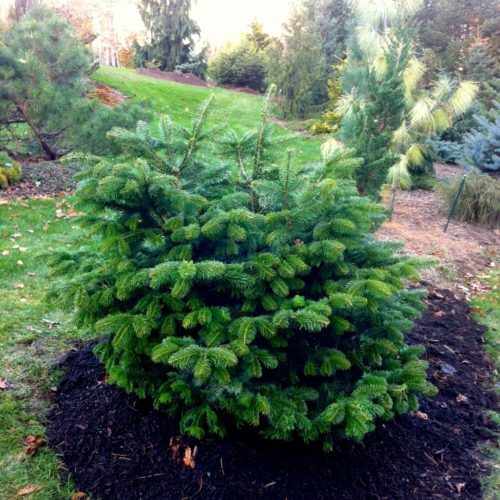 Abies alba 'Barabits Star' is a dense, compact cultivar. The needles are looking forward, yellowish on top. A witch's broom with regular conical habit, 6 feet 7 inches (2 m) high at 30 years. The original plant is in the Barabits' Pinetum, Sopron, Hungary. Discovered in 1965 by Dr. Barabits. Introduced by Egzota Nursery of Dr. Barabits in Sopron, Hungary. Patented by the Hungarian Agricultural Quality Control Institute, Budapest in 1975. 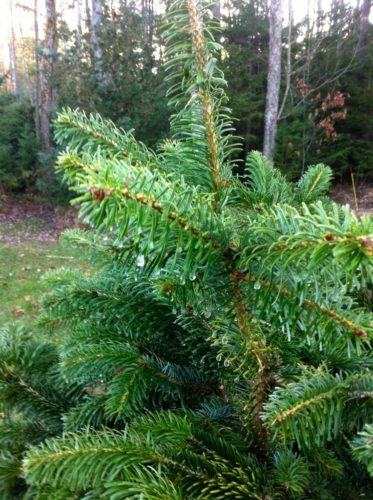 Abies alba 'Barabits Star', an approximately 10 year old specimen photographed in Brunswick, ME, Nov. 2013. Abies alba 'Barabits Star', foliage detail, photographed in Brunswick, ME, Nov. 2013.